She says..... ''First of all, the case was between Lagos state Government Vs Ibinabo Fiberesima but not Giwa Vs Ibinabo Febresima. On this faithful day of Feb 26th 2006 along the Lekki Epe Express way, my late brother Dr Giwa was driving with his brother and another family friend in his car coming from a meeting in Ajah, they were held up in a traffic around the evening time, when this tragic accident happened. Ibinabo was driving towards Lekki while the late Dr Giwa was coming from the other direction facing towards Island, just by shop-rite, when ibinabo's jeep flipped and lost control from her lane jumped over the culvert or pavement that demarcate the road from the on coming vehicle. The speed that skipped and flipped a jeep over the road demarcation will be considered "Reckless and Endangerment" because the VIO dept checked the jeep brakes, the engine and all the mechanical and electrical of the jeep but the result shows nothing wrong with the jeep and confirm that the accident as due to "OVER SPEEDING" in which the result was on record. After the accident, Ibinabo left the scene of the accident without checking for any survivors, she took the license plate and registration out of the car and fled from the scene, that was considered "HIT AND RUN". 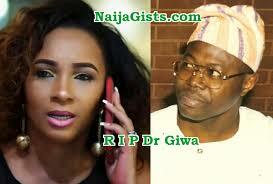 The people at the scene of the accident recognized her as Ibinabo Febresima, and stated she was drunk. "Driving Under Influence" of whatever she had. The State Department of Transportation has to use the VIN number to locate the Owner of the jeep, in which the owner was Daniel Wilson. That was my very first time of hearing the name of Ibinabo Febresima.The Doctor died at the scene of the accident because the jeep was on top of the Honda accord driven by him and they couldn't save him on time because of the seat belt and the weight of the jeep, the brother and the other family friend in that car had survived. Did she know the state of mind and the emotional instability of the people involved in that accident up till now, Ibinabo has never been in a Comma. After all the evidences against her, with the result of the VIO by the State department of Transportation, The DPP office took over and charged her to court and she hired Festus Kiamo in which after reviewing the case he withdrew by saying he cannot represent her because it's a bad case. Doctor Giwa has a living mother for goodness sake, wife with 3 children's, Ibinabo deprived him from seeing his children graduate from university and getting married, also from being the one to bury his mother at her old age, "Whereas no one ever prayed that on the day of their children's success and happiness they should replaced them with someone else". People say there is no justice in Nigeria, but it does once in awhile. The lower court magistrate O.A Isaac found her guilty with the option of 100,000.00 Naira, which is considered a judicial recklessness, 100k does not even buy an iPad, the life of someone does not worth more that 100k, so that people will take the liberty of committing crimes. Later Justice Deborah Oluwayemi of the High court find her guilty and overturn the option of fine and gave her 5 yrs in prison, she spent 3 weeks and came out on bail to go to Court of Appeal, however, how can a convicted person came out on bail, here in USA you will be in jail and they will transport you to and from each time you have an hearing. Finally Appeal court found her guilty and sentence her to 5 years imprisoned. Let her face the wrath, it is said that you can run but can't hide, it's a law of Kama that catch up, This will serve as a deterrent to others. Who will believe after 10yrs she will still be slammed, The Family of the late Dr Giwa had moved on with our life's, She was forgiven, it was very difficult and painful, but God gave us especially his mother and children the fortitude to bear the loss. On behalf of our families and friends, we really thank the Lagos State Government, The attorney general Mr Sasore, DPP Mrs Odutola and colleagues, Justice Deborah Oluwayemi, Justice Jamilu Yammama Tukur, Justice U.I Udukwe-Anyawu and Justice Tijani Abubakar and everyone for their support, no evil shall befall anyone, as you all go out and come in, may God's grace and protection abide with each and everyone. 'JUSTICE AT LAST' !!!!!!!!!!!!!!!!!!! JUSTICE AT LAST !!!!!!!!!!!!!!! JUSTICE IS FINALLY DONE !!!!!!!!!!!!. "IBINABO HAS NEVER PAID A DIME TO ANY FAMILY MEMBER OF THE LATE DR GIWA AS INDICATED BY HER FRIEND'S, AND IF SHE DID PAY ANY FAMILY MEMBER, SHE NEEDS TO START MENTIONING NAMES NOW".